Word received this evening that the venerable theologian and priest, Father Benedict Ashley, OP, 97, died today. Father Benedict was a teacher of mine when I was in St Louis. Born and raised in Oklahoma, Father Benedict was a professed member of the Order of Preachers–Saint Albert the Great Province– for 71 years and a priest. He was educated at the University of Chicago, the University of Notre Dame, Aquinas Institute of Theology (River Forest, IL) and the Angelicum. Father Benedict was the author (or, co-author) of at least 19 books and numerous articles. Among Ashely’s academic interests were healthcare and social ethics and intellectual history. Faith and reason (science) coalesced in the life and work of this Dominican friar. He was a terrific priest and teacher, a man of the Church and person of great humanity. Ashley was a member of the River Forest School of Thomism and he helped to form the Albertus Magnus Lyceum which was an effort to respond to Pope Leo XIIIs call to re-establish the thought of the 13th century Saint Thomas Aquinas into the life of the Church. This thought is called Thomism. He was a professor of moral theology at the Aquinas Institute of Theology (St Louis, MO). Ashley’s Barefoot Journeying ~ An Autobiography of a Begging Friar is available at New Priory Press. A biographical essay may be read here. 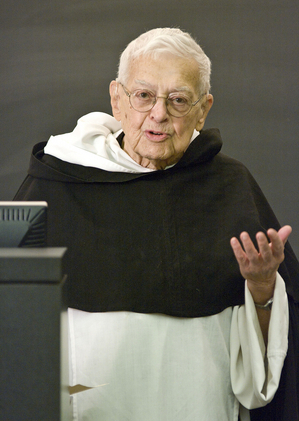 Dominican Father Richard Peddicord edited a collection of essays in honor of Father Ashley, In Medio Ecclesiae (2007), on the occasion of Ashley’s 90th birthday. May Father Benedict’s memory be eternal.